In 2003 I was living in New York and trying to make a go of it as an actress. I wasn’t having much luck getting paying gigs and at 5’11” I was always being told that I should model, so I got myself an agent and added aspiring model to my resume. I got a few modeling jobs but quickly felt the need to drop some weight to be more competitive. I was about 145 lbs, which is pretty thin for 5’11” but that agent told me that I would do a lot better if I lost 15-20 pounds. Ok, I thought, I can do that. Stop drinking so much, eat healthy, exercise more and the weight would fall off, right? I dropped a few numbers on the scale but was nowhere near my “goal weight” of 130. So I started throwing up. Now, I didn’t think of myself as bulimic or having an eating disorder or anything, because I didn’t do it every day and most of the time I didn’t even have to stick my finger down my throat. See I had a system… I would go all day, running around to castings, exercising, walking everywhere, and only eat 1 or 2 “Zone” bars a day just to keep myself from fainting. But then sometimes at night my discipline would waver and I would be so starving that I would eat whatever I could find, which would make me so nauseous that I would be clutching the toilet in no time. I realized at that moment that I was never going to be what they wanted me to be, that I was not meant to be one hundred and thirty pounds, or at least that I couldn’t get to that weight without doing serious damage to my body. So I quit. If a modeling job came my way and they liked the way I looked then fine, but I was done making myself sick for it. I am not going to lie and say it was easy. Over the course of a few months I figured out how to get my eating back into better habits and I started keeping track of and celebrating the days I went without throwing up. I figured out that it was more important to be a happy, healthy me than to be 130lbs. Flash forward to 2014. I am 34 and way past my modeling days with twin two-year olds. I step onto the scale and start to cry when I see the numbers flash until they reach 130.0. See for once in my life I am trying to gain weight. I am recovering from my third major surgery in four months and no matter what I do I keep loosing weight. I had to have my entire colon removed because of an auto-immune disease called ulcerative colitis and now it is difficult for my body to process nutrients. In addition to being super skinny, I am also deficient in several vitamins, severely anemic and weak and get out of breath when going up half a flight of stairs. And yet… everyone is telling me how good I look. Joking that colon-removal is the new fad diet. Making me wonder if when I am better and start gaining weight again I will miss that little number on the scale. 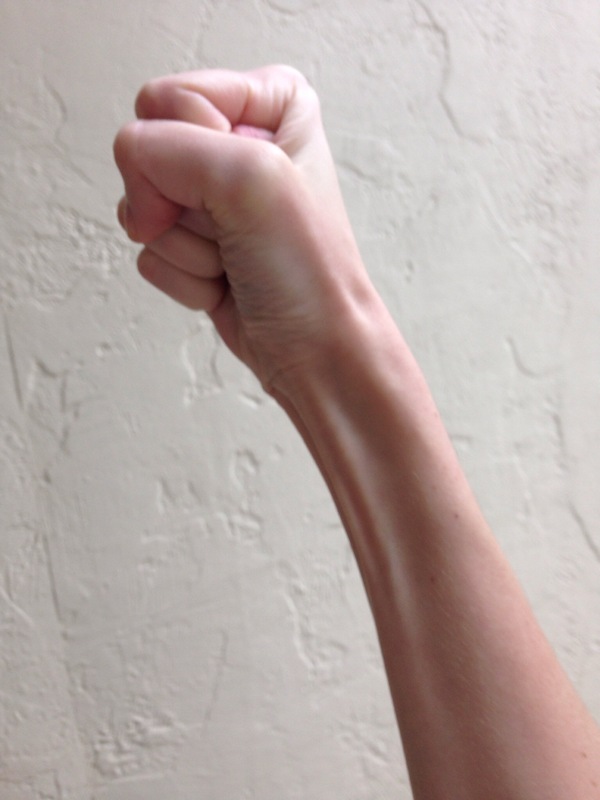 This was supposed to be a pic of me shaking my fist in Righteous Fury but it really just shows how skinny my arm is! No matter how crappy I feel, there is still a tiny voice in the back of my head that is pleased that all my clothes are too big and that for the very first time I can remember in my adult life I can look in the mirror and have no criticisms about my weight. Old habits die hard and old dreams even harder. I try to remember that now I have different dreams and the ones I have actually make me feel good about myself and my life. I want to get strong and healthy again so that I can play with my adorable girls without running out of breath. I want to get back my energy so I can spend time with my amazing husband who has supported me through a really tough period of time. I want to learn to feel good about my body so that I can teach my children as they grow up that their bodies are beautiful whatever size they are. I realize that I am crying because 130 is a number I never thought I would reach and because a part of me is doing a little victory dance but also because I realize what a toll it took on my body to reach that goal from so many years ago and hope that I can finally let it go. “Natalie Howe: Plus Sized Model” – something that has never been said by anyone who’s a human being. You should have rammed a bag of chips down his throat.